Everyone knows the basics of the story of SF and its seemingly never-ending construction, so let me just go over it once again. You’re welcome. The ground was broken on the site in 1882 and, at the time of writing in 2018, the cathedral is still strewn with cranes and scaffolding. It’s estimated that the church towers will finally be finished around 2026, which will be the centenary of Gaudi’s death. Other decorative elements are not expected to be finished until after 2030. Anyway, despite the fact that the cathedral isn’t even finished yet, it has already earned UNESCO World Heritage status. That’s a rather incredible feat, considering it might be crap when it’s done. I jest, course. It’s already jaw-dropping, so it can only more so in the future. Rather incredibly, the church receives (and has received) no public funding. The investment comes entirely from a private donor and, these days, entry fees. Going to visit SF will not only blow your mind, but it will also help to complete the works. I first visited in 2006 and the difference from just over a decade into its near 135-year construction was marked. Instantly recognisable and can generally be spotted from a distance due to all the people taking photos. More commonly known by its nickname, ‘La Pedrera (the quarry), this building is the last of Gaudi’s civil works and was completed in 1912 on Passeig de Gracia. The building was commissioned by a wealthy widow and her second husband, Pere Mila and caused controversy surrounding its curved design and very unique style. 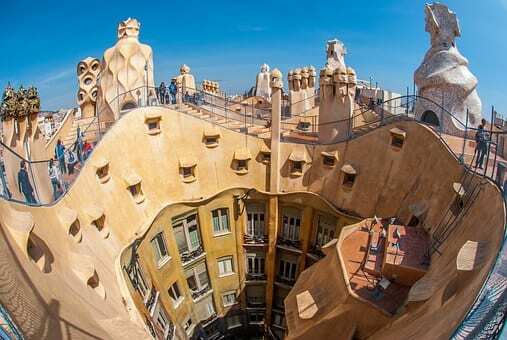 Gaudi was asked to design the property as a residential home, which you’d have real difficulty getting through the planning process in this day and age. Changing your windows can be problematic, but building a massive curvy house without load-bearing walls would have you tangled up with your local council FOREVER. These days, the building’s occupied by the Fundacio Catalunya La Pedrera, who offer the property as an exhibition space and attraction. You can wonder at the marvellous design from the inside and take a trip up to the stunning roof terrace. Casa Mila is an incredible building, sitting on the corner of the street, surrounded by other structures that pale into comparison beside it. However, this beauty does come with a price, with adult tickets coming in at a quite astounding €39.50 each. Kids under 7 go free so if you do have little ones, you might not quite* need a second mortgage to get your entire family in. In all seriousness, though, it is a unique building and you won’t be disappointed with your visit. Poorer, yes, but not disappointed. There’s also a shop and a restaurant on site. If you’re a millionaire. As with Sagrada Familia, La Pedrera is a UNESCO World Heritage site. Situated on Carmel Hill above the city, Parc Guell offers a stunning view across the city. It’s a real mix of coloured Mediterranean tile and colourless rock passageways; very similar to the facades of SF. Guell is a public park and is a maze of beautiful land, walkways and viewpoints. Given its location, it’s a fair climb up the side of a hill just to reach the entrance, and it’s no less steep once you enter. It’s even more challenging when it’s 32 degrees, so take water and comfortable shoes. Still, it’s very much worth the exhaustion to have a look inside. Tickets for the monument are priced at €6 each and are allocated in 30-minute slots. At the height of the season, it’s anxiety-inducingly busy (for me, anyway), so it’s best to pre-order online to ensure your place. There is also a charge if you wish to visit Gaudi’s home – now the Gaudi Museum – which is also located here. The undoubted highlight of the parc is the buildings at the entrance gates with their Spanish tile glinting in the sunshine. El Drac, which is the often photographed salamander sculpture, is also incredible. I didn’t have to pay to have my photo taken with him back in 2006, but such is life in 2017. In 2007, El Drac was badly vandalised. He has since been restored to his former glory and continues to snake proudly down the staircase of Parc Guell. If colourful animals are your thing, do visit the parrots (you can usually hear them) on your way around. These lovely birdies live in the grounds and are very fond of singing for tourists. Battlo is widely regarded as one of Gaudi’s masterpieces and is located on Passeig de Gracia. The Batllo family bought the building in the early 1900s. Due to its skeletal structure, the property is known locally at the ‘House of Bones’. The exterior of the building is divided into three distinct sections. The lower level is built from Monjuic sandstone, with the uneven lines showing classic Gaudi styling. The middle section has a series of colourful balconies and designs, while the roof looks like the scaly back of a dragon. As well as the impressive exterior, Casa Batllo also has a great deal to offer inside. Part of the building is open to the public as a museum where visitors can see the famous Noble Floor. Tickets are available for between €22.50 to €29.50. It might seem a touch expensive, but it’s really outstanding from the inside. Alternatively, go stare at it from outside. It’s impossible not to be impressed by the detail. Gaudi built Casa Calvet for tile manufacturer, Pere Calvet. In comparison with more ‘recent’ works, it’s a pretty conservative building. However, it still has Gaudi hallmarks at every turn; particularly in terms of the rooftop and wrought iron balconies. The building is located on Carrer de Casp in the Eixample neighbourhood. It has a restaurant on the bottom floor, which is the only part of the building open to the public. The eatery, ingeniously called Restaurant Casa Calvet, isn’t quite as expensive as you’d think. The weekly lunch menu comes in at just shy of €40. check out these gates. You will NEVER be broken into at Casa Vicens. Purchased by Mora Banc in 2014, Casa Vicens is a private property. Boo! The home is being restored and will become a public museum. Yay! Gaudi completed the project when he was just 30 years old, under the commission of Manuel Vicens Montaner. When I was 30, I still couldn’t build a decent looking house with Lego. Señor Montaner was a tile merchant, which explains the insanely colourful design of the home’s exterior facade. Vicens was the first private residence designed by Gaudi and was very well received at the time. His subsequent, shall we say, ‘curvy’ designs were not quite as popular with the locals. Casa Vicens has been a UNESCO World Heritage Site since 2005. What’s your favourite Gaudi design in Barcelona? This looks like such a beautiful place to visit! Thanks for sharing! I got to live in Southern Spain for about 3 years but never made it up to Barcelona. Spain is such a beautiful country!